As one moves from Tilbury and Gravesend to the sea, the tidal mudflats and salt-marshes become the dominant habitats. These attract large numbers of ducks, geese and waders in winter. Bird reserves like Elmley marshes have become justly famous. But there is much more than birdlife: wild flowers are good at colonising the impoverished soils of old industrial sites, and these bring in insects, followed by insect-eating animals. Going from small to large, one will see seals basking on the sand banks off Southend and you may see dolphins or porpoises. 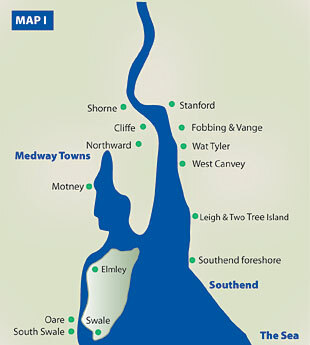 Although the lower Thames and Medway are busy ports, with major river-side industries, there are wide open spaces all around. The Thames Estuary Path and the South Saxon Shore Way take over from the Thames Path to continue the long-distance paths on either side of the Thames to the North Sea coast. If you have time, these paths are the best way to explore the Thames Wilderness.